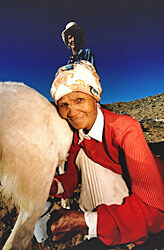 Moving home, stock and family in search of better grazing, the Namas were traditionally a nomadic people. In tune with the harsh environment, the Richtersvelders today are transhumant pastoralists, moving their livestock between stock posts with the changing of seasons. The rotation of pastures has helped to preserve the land from overuse. This is the last place in the South Africa where pastoral people live on communal lands and one of the last remaining examples of the transhumant Nama way of living. With them the Nama people also carry their cultural beliefs, and so have helped through the years to preserve their culture, language and customs. While Afrikaans is today the preferred written language, one can still hear the ancient ‘click-sounding’ Nama language across the Richtersveld. Traditional music can also still be heard in this area, and will make Nama men and women proudly show their stapdans. Textile painting using motifs taken from rock art and the environment, leather clothing, and the lappiesrok, a dress made of patches of cloth off-cuts, all bear testimony to the strong crafts tradition among the Nama people.